The lady known widely as the Hoya Pimpette and more widely as the Queen Pimp, has her bloomers in a whole bunch of knots because I questioned the identity of her offering on e-Bay. I guess I would too if I stood to lose a small fortune if someone decided to believe me instead of her and I lost a sale. As of 11 Aug. it was unsold but had another day and a few hours left to run. Oh, it says four people have bid on it but if you read Dave’s Garden you know that the high bidder is a set up to bring the price up. After all, l the Q.P. has advertised far and wide that she just came back from Eugene, Oregon where she visited that bidder for several days (even displayed pictures of them together). Very few in the Hoya World would ever believe that a cent of money will be exchanged for that plant unless some poor ignorant stranger outbids the Q. P.’s current stooge. Those of us with long experience with the Q.P have so often been asked by her to go on line and say this or that (so she won’t be blamed for saying it) or to bid on this or that to get her a higher price. We are wise to her. Her fanatical protestations on e-Bay recalls the bard’s statement about protesting too much. 1977: Although Mr. Green wrote in his publication of the name Hoya vanuatuensis, that he thought from the start that it was Hoya diptera and that he’d called it that for thirty years, that simply IS NOT true. This was listed in a US sales’ catalog for the first time by Mr. Ted Green in 1977. The label he put on it was Hoya chlorantha, not Hoya diptera. I bought it and knew immediately it was mislabeled. I wrote and told him so, enclosing a copy of Rechinger’s original publication AND the drawing of Hoya chlorantha that accompanied it. In reply, I got a letter from Mr. Green saying, “I caught that too but I had to call it something.” In other words, he said that he KNEW it wasn’t Hoya chlorantha but labeled it that anyway. To my reply of, “If you call this one Hoya chlorantha what are you going to call Hoya chlorantha when you find the real one?,” he didn’t say but a few years later (1980 to be exact) he listed it as Hoya filiformis. 1980: He wrote a short article and published it in the Hoyan (vol. 1, #3, page 62). In that article he described a hoya he called Hoya chlorantha as being the largest hoya plant he’d ever seen and said that it was located on the Island of Efate in the New Hebrides. (Now Vanuatu). 1981: His catalog still listed this as Hoya chlorantha. 1982: His catalog still listed this as Hoya chlorantha. 1983: In a letter from Mr. Green, published in The Hoyan (vol. 4, #4, page 103, Mr. Green said, (speaking of this same hoya), “This is the one I mentioned before in the Hoyan as being the largest hoya vine that I had ever seen for it took over the whole interior of a giant banyan tree. At that time, I assumed that it was the Hoya chlorantha as listed by the 1971 British Expedition. I was wrong and didn’t recognize it for what it was until the article in the Hoyan by M. F. Symonds. His collection was from Fiji, as are my new ones, and flowering side by side are nearly identical.” So you see, Mr. Green has not, as he said in his publication of the name Hoya vanuatuensis called it Hoya diptera for over 30 years. He’s called it that for only 23 years. 1983 until mid-2006: Mr. Green listed this in all his catalogs as Hoya diptera. To customers who ordered Hoya diptera, he sent whichever of the two species was handiest (I presume) as I know several people who got the one and several who got the other. Mr. Green’s statement that his calling this species by the erroneous name of Hoya diptera went unchallenged for 30 years is completely untrue. I challenged it over and over again both in the Hoyan and in private correspondence. Others did also. His standard reply when challenged was to say, “I have the largest collection of hoyas in the world and I have introduced more hoyas into trade than anyone” I CHALLENGE THAT TOO. I grant him one thing. He has introduced more wrong names than anyone else in the world. Everyone has misidentified a few things but Ted Green has misidentified almost every hoya in his catalog at one time or another. So, if Mr. Green is so good at looking a hoyas and telling you what they are, why, for Pete’s sake, couldn’t he, in 1982, tell Hoya vanuatuensis from Hoya diptera when he had blooming plants side by side? He was 24 years younger in 1982 and so was his eye-sight!!!!!!!! And what about the following off the wall identities of Mr. Green’s over the years? I mention only a few of those that Mr. Green has claimed are “dead-ringers” (his words exactly). 1982: In this case he confused three different species. His catalog listed a species as “Hoya sp. 80-05.” He did not give it a name but at the end of his description he wrote, “Lasiantha?” I wrote to him and told him that identity could not possibly right. His reply (Letter still in my file). “It is a dead-ringer for the picture in Curtis’ Botanical Magazine.” Let me remind you that this “dead-ringer” is the one he now calls Hoya meredithii and that Hoya meredithii is NOT a valid publication. 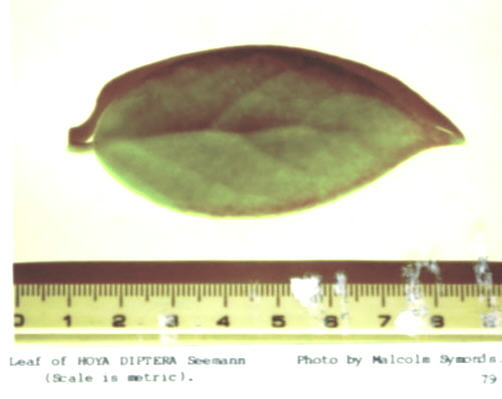 It is not a valid publication because Mr. Green cited two holotypes in his publication because he couldn’t tell the difference between this species and the one he later published as Hoya callistophylla. Wouldn’t have mattered much anyway because this species already had a validly published name, which is Hoya vitellinoides. If Mr. Green thought Hoya lasiantha, Hoya vitellinoides and Hoya callistophylla the same species at any time, would you trust him to know the difference between the Q. P.’s plant and Hoya vanuatuensis? I sure as heck wouldn’t. I’m reminded of the late Goodale Moir who, in his dotage, wrote a short piece about a plant he thought was Hoya purpurea-fusca. This was a man who, in his prime, probably knew more about orchids and bromeliads than any person alive. He didn’t know hoyas at all, though he had collected a few. I was pretty sure that the hoya he’d written about was not Hoya purpurea-fusca because I knew he’d been the one who collected the USDA-353450 which was misidentified in USDA inventory as Hoya purpurea-fusca. This made me reluctant to accept his article for publication without being 100% sure. So, I showed him two pictures in which both flowers and foliage were clearly visible. One was a picture of the old familiar Pink Silver which all sellers were selling as Hoya purpurea-fusca in those days (some still are) and the other was the picture of the true Hoya purpurea-fusca as pictured in Curtis’ Botanical Magazine. He looked at them and said, “Yes, that’s the one.” I asked which one was the one and he replied that they were both the same. I think Goodale Moir was about the same age then as Ted Green is now and so were his eyes. If Mr. Green thinks the Q. P.’s plant is Hoya vanuatuensis I suggest that he do as I did, recently – get lens transplants. 1980: ”Hoya sp. Phil 2” was described as having leaves “much like Hoya darwinii. The truth is that the leaves on Phil 2 were quite thick, from 4 to 6 inches long by about 2 inches wide. Hoya darwinii leaves (the leaf kind, not the ball shaped ones) are about the same length but not as wide and they are quite thin textured for a hoya. 1982: Hoya sp. Phil 2 became Hoya bordenii. Never mind that Schlechter said that Hoya bordenii had nearly parallel leaf veins and Phil 2 had pinnate leaf veins – these two were dead-ringers per Mr. Green. Since then, there has been controversy over which species Hoya sp. Phil 2 is. I say Hoya incrassata (syn. Hoya crassicaulis) and Kloppenburg says Hoya crassicaulis. Which of us is right has no bearing on this discussion so I won’t go there. 1984: Hoya sp. Bogor listed for 1st time as Hoya rumphii. What makes this so funny is that in 1984 he said to a group of us in Ft. Lauderdale that he had seen a type specimen of Hoya rumphii and it looked nothing like his plant and he simply couldn’t understand it. My retort at the time was, “Didn’t it ever occur to you that your plant is NOT Hoya rumphii? He didn’t reply. He continued to sell it as Hoya rumphii until 1995. 1996: He sold an entirely different species as Hoya rumphii. And what’s more he said not a word about it not being the same plant he’d sold with that label for the previous 12 plus years. The only way one could tell it was a different species was by reading the descriptions of both and note that he was obviously describing two different plants. He’d KNOWN all that time that the plant was not Hoya rumphii but sold it as that species anyway. 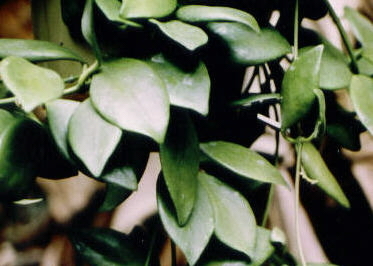 Mr. Green, shortly afterwards, came upon a living plant and advertised it as Hoya yunnanensis in his catalog. I immediately put an article in the Hoyan 14(3): 53 (1993), warning people that the hoya in Mr. Green’s catalog was not Hoya yunnanensis and that it wasn’t even a hoya. It was, in fact, Micholitzia obcordata N. E. Brown and had been published previously as Hoya manipurensis and as Hoya lantsangensis. The strange thing about this is that I had given Mr. Green copies of most of the original hoya name publications in exchange for cuttings. I know he had a copy of the Hoya yunnanensis publication and should have known from that publication that Hoya yunnanensis is a vining hoya with leaves that measure approximately 4 inches long and 2.5 inches wide. 1996: The closest Mr. Green ever came to telling his customers that the little plant that he (and only he) had been telling them was Hoya yunnanensis wasn’t that species, was on page 15 of his 1996 catalog. Here’s how his face-saving message read: “Some botanists place this plant in the genus Hoya –why I’ll never know!” He was correct that some botanists did place it in Hoya, but SO DID MR. GREEN. He is the only one who called it Hoya yunnanensis. DS-70 sold as Hoya bilobata (he nearly started WW3 when I challenged it) --- though I was 100% right, that it wasn’t Hoya bilobata, I am embarrassed to say that I misidentified the same species and am having a hellava time getting it corrected. I could go on and on in this vein but I’ve better ways to spend my time. The point I’m trying to make is that anyone who claims to have a correctly identified plant and use Ted Green as the authority for that name is treading on very thin ice. There isn’t any one of us that hasn’t misidentified a hoya or two or three, but Mr. Green’s score is almost without end. The list would fill a good sized book. The Q. P., who has it on the auction block has claimed that I couldn’t possibly tell by looking at that plant that it is not Hoya vanuatuensis as she claims and quoted me as saying that I cannot identify a plant without flowers. I’m reminded of the hordes of Bible quoters who take verses and partial verses out of context to justify their sins. I certainly can’t identify most hoya species by looking at a single leaf as the Q.P. and others have on many occasion asked me to. There are some I could not identify without flowers even if I saw an entire plant. There are a few I could identify by a single leaf. Hoya polyneura is one that comes to mind. As for the Q. P.’s e-Bay offering, I did NOT say what it was. I said that my best guess is that it is Hoya diptera. The more closely and the longer I look at it the more likely it appears to be that my best guess is correct. I say that because I grew both Hoya diptera and Hoya vanuatuensis (as sp. NH-1) for many years. When looking at an entire plant and it one you’ve grown for years, you see things that someone who is still a novice (and the Q.P. is a novice) doesn’t even think of looking for. The “posture” of the plant is different. The way it holds its leaves is different. The shape of the leaves are different. The curve of the petiole (or the straightness of the petiole) are different on different species. Leaves appear to be thin textured. Leaves are thick and stiff. out to only slightly down at tips. Leaf bases mostly rounded. Leaf bases both rounded and cuneate. Leaf costa very well defined. Leaf costa invisible. Leaf tips – long-acuminate and acute. Shortly acuminate obtusely pointed at tip. I believe that when the Q. P.’s plant blooms it will prove to be Hoya diptera. I could be wrong about that but I am NOT wrong in saying that it is NOT Hoya vanuatuensis (better known by me as NH-1). The above is a picture of a typical Hoya diptera leaf. This was published in The Hoyan many moons ago. Leaves not always dark margined but do get that way in winter sun. This is a portion of a picture Mr. Green sent to me for publication in The Hoyan. I refused because he was calling it Hoya chlorantha and I knew it wasn’t that species. A lot of error got into The Hoyan but only by accident or through ignorance. In this case, I wasn’t ignorant.